Union Joint Secy Atal Dulloo convening meeting of district officers at Kupwara on Thursday. 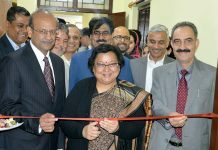 SRINAGAR, Dec 7: The Union Joint Secretary (RL), Atal Dulloo along with other senior officials today convened an interactive session with officers and engineers of district administration Kupwara. District Development Commissioner, Kupwara Khalid Jahangir presented welcome address and detailed power point presentation on performance of key-developmental sectors under different activities, carried out by the departments within the district launched under State and Central schemes for implementation and projected demands to review the public interested sectors and projected different issues under various sectors to seek suggestions and guidance from the visiting dignitary. The Central joint secretary was briefed about performance of various key-developmental sectors like education, health, sanitation. water, agriculture, horticulture, animal and sheep husbandry, irrigation, PHE, floriculture, R&B , rural development schemes being implemented in the district on the guidelines of the Government. Speaking on the occasion, the Joint Secretary impressed upon the district administration to formulate composite Action Plan and also identify deficiencies in various sectors. He said thrust be given on social sector, basic infrastructure, economic sector, besides gapes have to be identified under entrepreneurship, cold storage plants and other activities. The rapid transformation of district Kupwara was discussed thread bare. He assured full support on behalf of Central Govt and discuss the issues at country wide workshop in New Delhi under NITI Ayog, which is scheduled to be held on December 19 in which all members of all states are expected to participate. 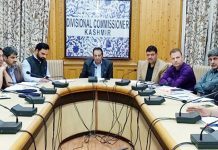 The Joint Secretary also sought suggestions from different experts of implementing and executing agencies during the course of interaction, in which the key sectoral experts gave their valuable suggestion’s to review the implementing schemes by them. 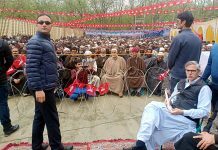 He expressed satisfaction over the presentation given by the District Administration on behalf of the people of district, headed by the District Development Commissioner Khalid Jahangir. 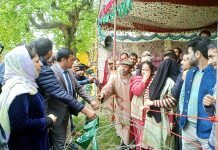 However, he sought source of funding to be raised under proposed action plans under rapid transformation of district Kupwara.